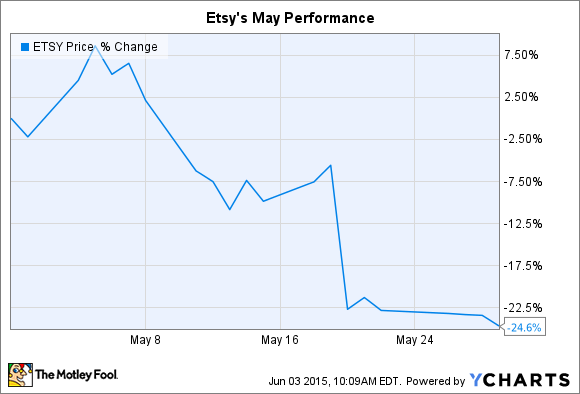 What: Online marketplace Etsy's (NASDAQ:ETSY) stock fell nearly 25% in May, according to S&P Capital IQ data. The plunge put shares just below the initial public offering price of $16 per share. However, the stock is down 50% from the trading price it quickly reached after the April 16 IPO. Finally, many investors might have jumped ship in May after hearing that Amazon.com is prepping a competing service called Handmade that will offer sellers a potentially huge market for their crafted goods. Now what: Etsy's established brand, along with its 1.4 million active sellers and 21 million buyers, give it a strong position to defend. The company has, after, all, been in business for 10 years. And there's no reason why Etsy couldn't succeed even if Amazon does as well. "This is a large market opportunity at the convergence of macro trends and employment, commerce, consumption and manufacturing and Etsy is well positioned," CEO Chad Dickerson told investors last month. Still, Wall Street's wildly swinging projections for this business promise to keep the stock extremely volatile -- at least until Etsy has a few quarters of public earnings reports under its belt.